DIABETES AND YOUR ORAL HEALTH | Leslie B. Anthony, D.M.D. Diabetes is a disease in which the body’s ability to produce or respond to the hormone insulin is impaired and the body cannot properly control the amount of sugar in the blood. If you or someone you love lives with diabetes, you know that diabetes can wreak havoc on the entire body. Diabetes can cause damage to the kidneys, eyes, nerves, the heart, as well as other parts of the body. 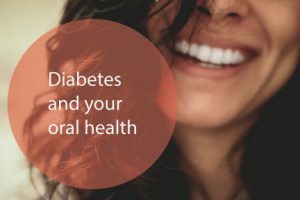 Did you know that diabetes can also negatively affect your oral health and that people with diabetes face a higher risk of oral health problems? Individuals diagnosed with diabetes are 3 to 4 times more likely to develop periodontal (gum) disease. Periodontal disease is a bacterial infection of the gums that can also affect the ligaments and bone that support your teeth. The main cause of periodontal disease is a buildup of plaque that forms on your teeth. This plaque is a sticky film full of bacteria and if not properly removed can irritate the gums and eventually lead to infection. Periodontal disease like any infection in the body can also make it harder to control your blood sugar levels. How can Dr. Leslie Anthony help you fight diabetes? Scheduling and keeping regular dental visits with Leslie B. Anthony D.M.D is important. may greatly reduce the potential for infections from periodontal disease. It is important to take good care of your teeth and gums and even more crucial if you have diabetes. Make a commitment to manage your diabetes. Work closely with your team of health care providers and keep your blood sugar within the target range. The better you are able to control your blood sugar level, the less likely you are to develop periodontal disease or other oral health complications. It is important that Dr. Leslie Anthony be kept up-to-date on your diabetic condition and treatment and that your physician be kept up-to-date on your oral condition and treatment, so that they can work together to help you control your diabetes and prevent or control periodontal disease. Keep Dr. Leslie Anthony and our caring team of hygienists informed of any changes in your condition and any medication you are taking. Leslie Anthony D.M.D is here to help. Let Dr. Leslie Anthony be a partner in your health care team to help you manage your diabetes.